A slightly delayed recipe perfect for the 4th July. 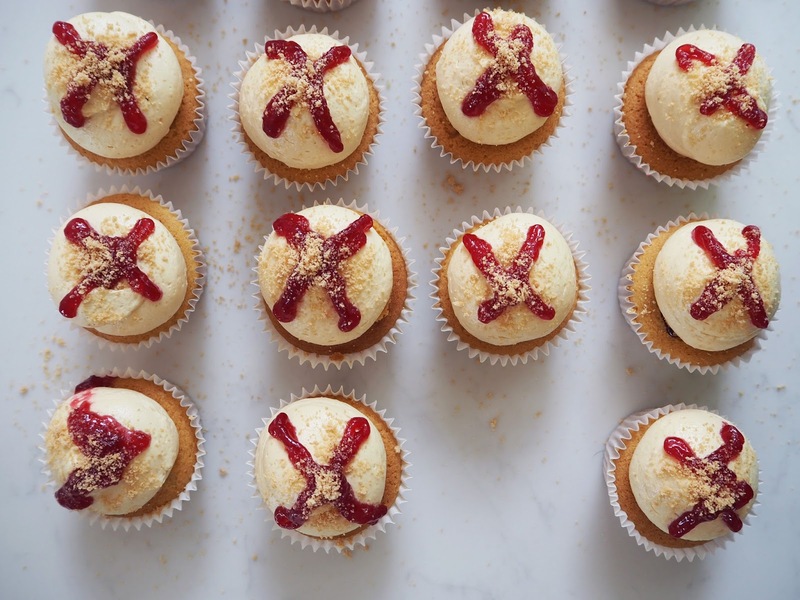 Peanut butter and jelly is the epitome of American food and when I saw the cupcake version I had to give them a go. Everyone that has tasted one of these, even people who don't like peanut butter, have had to have another. I have made batch after batch and every time I am met with nothing but positive feedback. My favourite part...the peanut butter crumb sprinkled on top! Preheat the oven to 170C fan. Line a cupcake tray with cases. Sift all the dry ingredients into a large mixing bowl. Add the butter, eggs and peanut butter and beat until smooth and combined. Scrape down the sides, pour in the milk and beat until fully incorporated. Fill the cupcake cases about 3/4 full. Place in the oven and bake for 20 minutes or until golden and spring back when touched. Leave to cool for 10 minutes then transfer to a wire rack to cool completely. Whilst the cakes are cooling make the peanut crumb. Place the peanut butter and icing sugar in a food processor and whizz for 2-3 minutes until they form a crumb. For the icing place the butter and peanut butter in a mixing bowl and beat for 5-6 minutes until pale and fluffy. Sift the icing sugar into the bowl and beat on a slow speed, turning to high speed until combined. Pour in the milk and beat well for 5-6 minutes until light and fluffy. Once the cakes are cooled, create a hole in the middle and place a tsp of jam in the hole. 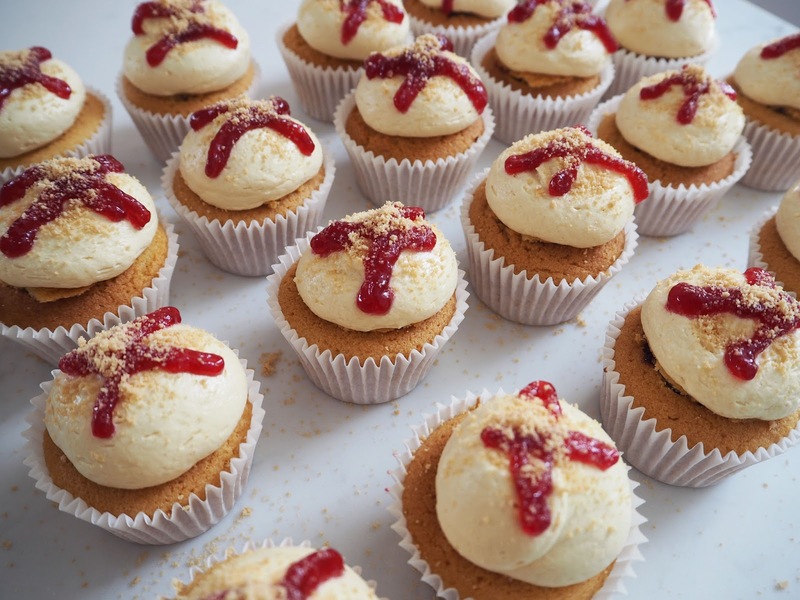 Fill a piping bag with buttercream and pipe onto the cakes. 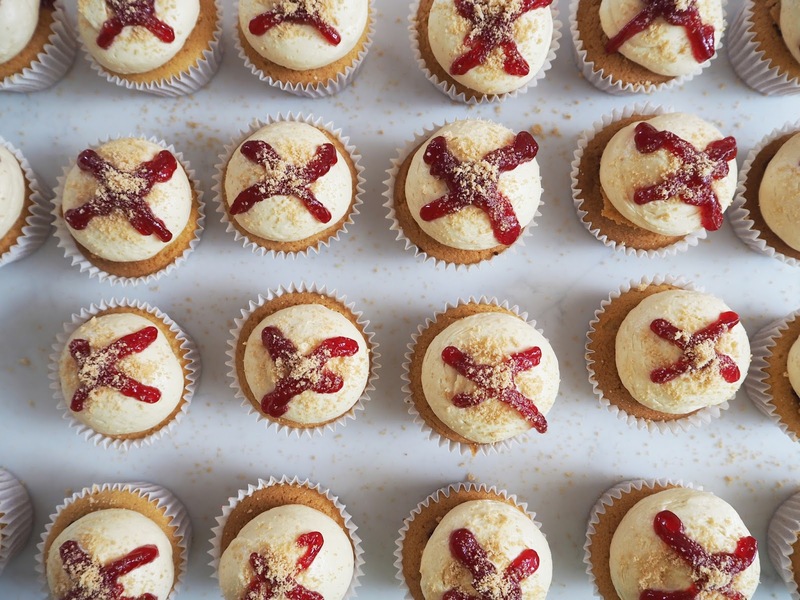 Fill another piping bag with jam and squeeze onto the icing. To finish sprinkle with the peanut butter crumb.